As the highest point of your property, your chimneys can suffer in strong winds and stormy weather. If your chimneys are leaking, contact a roofer from G&A for help. Our team can provide chimney pot re-fitting, chimney re-building, chimney removal, repairs for lead flashings and brickwork re-pointing. If you need emergency repairs and maintenance for your property, contact our reliable and skilled team of emergency roofers. 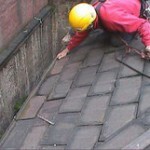 The emergency roof repairs service at G&A comes highly recommended. We offer a prompt, professional response to deal with properties that have suffered storm damage. Call our team of emergency roofers for a fast response today. Contact G&A Roofing and Building Winchmore Hill and New Barnet to discuss your requirements with a roofer today. Call us on 020 7205 5785. This entry was posted in Chimney Repairs and tagged chimney, New Barnet, rebuilds, repairs, Winchmore Hill. Bookmark the permalink. Hello, a lot of debris, including a large piece of mortar, has come down one of our chimneys today. Could someone please come round to have a look – ideally tomorrow (Sunday)? We are in Winchmore Hill.